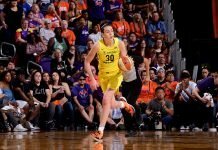 Two days ago, it was announced that three players at Cynthia Cooper-Dyke’s University of North Carolina-Wilmington had been granted releases from the team. One – Jessica Cohen – now says she never asked for the release, as UNCW reported. The season began in controversy last fall, when Julia Finlay left the team after suffering harsh punishment at a practice run by assistant coach Johnetta Hayes. So what’s up at UNCW?